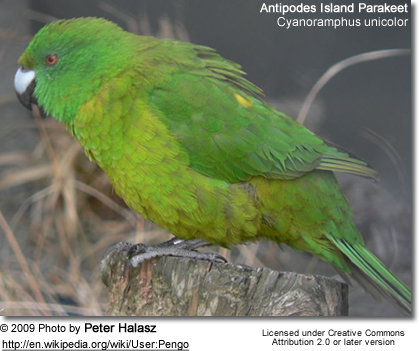 The Antipodes Island Parakeet, Cyanoramphus unicolor, also known as the green parakeet, lives only on Antipodes Island - one of New Zealand's southern, remote, bleak and inhospitable subantarctic islands (~62 sq.km in size). Antipodes Island is situated in the South Pacific Ocean, 850 km south-east of New Zealand. It is one of two parrot species found on the islands. It is also the only home of the smaller Reischek's Parakeet (Cyanoramphus hochstetteri). 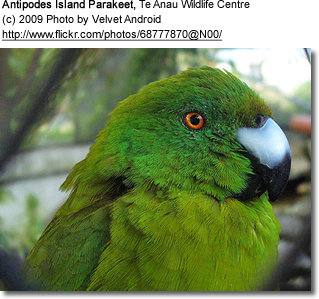 Interestingly, hybridization between the two island Kakariki has occurred in captivity, but is not known in the wild. It is the largest and most specialized Kakariki and the largest of the Cyanoramphus (kakariki) species, averaging 12 inches or 30 - 31cm in length (including the tail) - 3 cm or 1.2 inches longer than the New Zealand red-crowned parakeet. 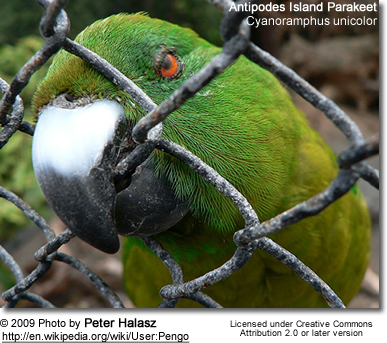 The Antipodes Island parakeet is the only member of the kakariki family with all green coloring, and without a colored frontal head band. Its general plumage is green. The breast, abdomen and under tail-coverts are yellowish-green. The outer webs of its flight-feathers are violet-blue. The irises are orange; the feet are grey. It has a pale bluish-grey beak with blackish tip. Immature birds look like adult. Antipodes Island is a cold, wind-swept, inhospitable volcanic island to the south of New Zealand that is designated as a Nature Reserve. The local flora is limited to two species of tussock grass, ferns and some stunted shrubs. As there are no trees, this parakeet has adapted to breeding on the ground. Its nest is in a well drained burrow a meter deep in the fibrous peat under tussock grass. These parakeets have very little fear of humans and, like all parrots, have a strong natural curiosity. Whilst there appears to be no immediate danger to the status of these parrots, they are vulnerable to the accidental introduction of predators such as rats or cats to the islands. This parakeet eats leaves, buds, grass, and tussock stalks, as well as sometimes feeding on seeds, flowers and berries. However, they will also scavenge carrion of dead penguins and petrels and eat the eggs of seabirds. The Antipodes Island Parakeet preys on Grey-backed Storm-petrels. It will enter burrows to kill incubating adults, even dig at the entrance if it is too small. The breeding season is between November and January. The Antipodes Island Parakeet nests in underground burrows that are often more than one meter long, in tussock or sedge. In captivity, a clutch usually consists of two to six eggs. In the wild, only one to three fledged young are generally seen with adults. Eggs are incubated for about 26 days. The young probably start breeding at one year. This species is quiet, only letting out a single note when startled.